In the last days of July, the backbone of Belarusian economy - the potash industry - suffered a severe blow dealt by its Russian partner. The Russian company Uralkali refused to work anymore with the Belarusian Potash Company (BKK), a joint enterprise of Uralkali and Belaruskali authorised to sell their products throughout the world. These developments have seriously weakened the global position of Belaruskali. The “potash collapse” is just one more illustration of the problematic relations between Belarus and Russia. Both Russian private business and the government do not perceive their Belarusian counterparts as equal partners. Additionally, Belarusians have to work with Russian business without a sufficient legal framework. In these circumstances, integration between the two countries has had no real chance from the very beginning. Some bigger agreements simply failed or fell apart like the joint companies in the potash or oil industry. 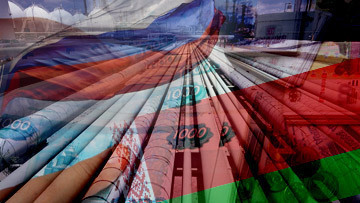 Other projects were implemented many years behind the schedule - whether it be military cooperation or the sale of Belarusian pipelines to Russia. Russian Uralkali, of course, immediately blamed Belarus for the failures of the joint business venture. The Director of Uralkali said to the Vedomosti daily newspaper that it was Lukashenka who allowed the national mining company Belaruskali to sell potash without involving the Belarusian Potash Company and violated thus the previous agreement to work through this company. Yet the Uralkali itself has sold a bulk of its own goods without the Belarusian Potash Company. In the least, the Russian position looks dubious. An information war followed soon afterwards. “This situation confirms only one truth – Belarusians, as always, are incapable of working with partners in a civilised way,” said the well-known Russian political commentator Andrei Suzdaltsev Radio of Liberty. Yet the background of this story indicates that something different might have happened. Suleiman Kerimov, the Russian owner of Uralkali, wanted to acquire Belaruskali as he previously acquired another competitor of Uralkali – Silvinit. If he only managed to add Belaruskali to its business empire, he could control up to 43% of global potash market. Kiryl Koktysh of the Moscow State Institute of International Relations says that Uralkali's actions may indicate Kerimov's attempt to force Minsk into selling Belaruskali. With all of its problems, the Belarusian Potash Company was, according to Belarusian economic web-portal zautra.by “probably, one of the most successful strategic Belarusian-Russian economic alliances to have existed since the moment of the Soviet Union's demise”. This begs a question: if this was the best, how exactly have the other projects? The chronicle of Belarusian-Russian integration looks like a tug-of-war between Minsk and Moscow. Pompous rhetoric are dismissed by the reality of trade wars and agreements' delayed implementation. The list of failed major projects between the two countries is another skeleton in the closet of bilateral relations. Project on PET-granules production on facilities of Mahilyou's company “BelPAK” by the Russian Itera 2001-2006 By 2003, Itera allegedly invested more than USD14 million. It is more to the point at this time to talk about Belarus-Russian disintegration rather than integration. Some experts admit that the problems in Belarus-Russian relations exist yet believe that some areas are integrating smoothly, defence cooperation in particular. Anaïs Marin of the Finnish Institute of International Affairs argues in a publication of the Polish Centre for Eastern Studies that defence cooperation is “unfold[ing] regardless of the disputes that sporadically sour relations between Minsk and Moscow, standing out as the main achievement of the Union State [of Belarus and Russia] – if not the only one”. Yet, Minsk has delayed the implementation of every military agreement with Moscow, sometimes for years – as happened with the Single System of Air Defence. On the other hand, Moscow failed to equip its closest ally with adequate arms – only now, has Belarus finally replaced its remaining old air defence systems, the S-200, with the S-300. The Russian army meanwhile is already replacing the S-300 with S-400. Belarus has no real prospects to get any S-400 in coming years. It is no wonder, then, that the Kremlin does not care about its Belarusian allies. Despite the rhetoric of Belarusians defending Moscow, Belarus pursues its own military policy and enters military agreements with Russia when it wants Moscow to foot the bill. There are numerous reasons explain the failure of individual projects in Belarus-Russian relations. Yet there is one fundamental factor. Russia does not perceive Belarus as an independent state with its own needs and interests. "Russia believes that Belarus is its property," said once in Belsat TV Belarusian analyst Paval Usau. Actually Moscow looks in the same patrimonial way on all post-Soviet nations. The latest Russian-Ukrainian trade war proved this point once more. Partly, Belarus itself is guilty of the discriminatory behaviour that has been coming from Russia. First, Belarus is still failing to consolidate its own nation and to draw a dividing line with Russia. After all, good fences - both physical and mental - make good neighbours. The very close alliance between the US and Israel is a model proposed by Lukashenka for Belarus-Russia relations. Yet Washington looks on Tel-Aviv as an independent nation not as a breakaway territory. In particular, this means that Washington wishes for Israel to be robust and powerful. It is better to have a stronger ally. On the contrary, Moscow considers any Belarusian success as a threat. Thus, in recent years it did not welcome attempts by Minsk to diversify its sources of imported oil. Russia actively counteracted Belarus' policy of buying Venezuelan oil, which is quite logical from the Kremlin's perspective. If the Kremlin considers Belarus not as an ally but simply a breakaway territory, then this territory should not become strong. The reasons that Moscow does not give Belarus new military equipment become clearer when this is considered. As Anais Marin put it, the Russian establishment sees Belarus as a territory, and not real ally. Second factor between Russian dismissive stance towards Belarus is lack of a Belarusian lobby in Russia. The Belarusian government has done a lot to find such support in Russia. Minsk tried – rather successfully to present itself as the last island of sunk empire and to mobilise Russian right-wing political groups. The Belarusian regime clearly could find some support among Soviet-time generals, right-wing intellectuals and regional industrial bosses. Yet this support appears rather unorganised and gives Belarus little leverage in disputes with the Kremlin. In last decade, Russian officials have effectively renounced earlier rhetoric of integration with Russia. They apparently had no illusions that what Lukashenka has done – at least in the last decade – resembles a gradual separation from Russia. Furthermore, Minsk is not Russia's marionette. For all its services, the Belarusian state received from Russia subsidies which last year amounted to ca. USD10 billion (16 per cent of GDP). Oddly enough, it is often Western policies which drives Belarus into the Kremlin's hands. So, for example, the problems of the Belarusian Potash Company began last year when the EU threatened to impose sanctions on Belarus. It created a favourable atmosphere for Russians to put pressure on Minsk to sell Belaruskali to Russian potash magnate Kerimov. The media then reported about plans to found a new Russian-dominated potash company – Soyuzkali – whose office had to move from Belarus to Switzerland, i.e., under control of Kerimov. It did not happen, yet contributed to a crisis inside the Belarusian Potash Company. The Russian option for Belarus remains elusive. Objective opportunities which exist for Belarusian business and individual Belarusians in Russia are offset by huge biases against them that are regularly demonstrated by Russia. Moreover, aggressive Russian attempts to take over Belarusian assets leave little space for integration and cooperation between two countries. In a word, Belarus is not as close to Russia as frequently assumed and the West should never dismiss Belarus as an active actor.